A Yemeni judge sentenced two men, including one held in U.S. custody, to death Wednesday for orchestrating the 2000 suicide bombing of the USS Cole, and sentenced four others to prison terms ranging from five to 10 years. Jamal al-Badawi, a 35-year-old Yemeni, and Saudi-born Abd al-Rahim al-Nashiri were both sentenced to death for plotting, preparing and involvement in the bombing, which was blamed on Osama bin Laden's al Qaeda network and killed 17 American sailors as their destroyer refueled in the southern Yemeni port of Aden. Al-Badawi, who was in the heavily guarded court to hear his sentence along with four other Yemenis charged in relation to the bombing, would appeal the sentence, his brother, Mohamed al-Badawi, told The Associated Press. "This verdict is an American one and unjust," Jamal al-Badawi yelled from behind the bars of a courtroom cell after judge Najib al-Qaderi sentenced him to death. "There are no human rights in the world, except for the Americans. All the Muslims in the world are being used to serve American interests." Al-Nashiri, believed to be the mastermind of the Oct. 12, 2000 bombing, was the only one of the six men convicted by the judge not to be in court as he is being held in U.S. custody at an undisclosed location. The United States announced al-Nashiri's arrest in 2002. He was detained in the United Arab Emirates and transferred to American custody. U.S. officials believe he is a close associate of Saudi-born bin Laden, who is believed to have masterminded the Sept. 11, 2001 attacks in the United States. In addition to the Cole attack, al-Nashiri is suspected of helping direct the 1998 bombings of U.S. embassies in Kenya and Tanzania. The six men were all charged with belonging to al-Qaida and playing various roles in the attack on the Cole, which was carried out by suicide bombers Ibrahim al-Thawr and Abdullah al-Misawa, both Yemenis, who rammed an explosives-laden boat into the destroyer. "The evidence obtained by the court affirms the collaboration of the defendants in the case ... which harmed the country, its reputation and threatened its social stability and security," judge al-Qaderi told the court before issuing his sentences. 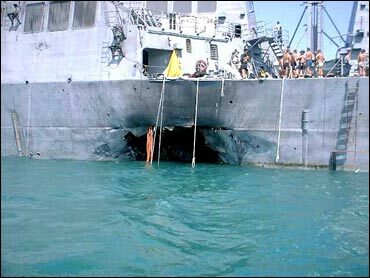 Al-Qaderi sentenced Fahd al-Qasa to 10 years in jail for filming the bombing, which left a gaping hole in the side of the destroyer, which was later repaired and returned to service. The court has heard that al-Qasa had traveled to Afghanistan in 1997 to train at an al Qaeda terrorist camp, but it was unclear how long he spent there before returning to Yemen, a tribal-dominated country located at the southern tip of the Arabian Peninsula. Maamoun Msouh received an eight-year prison term for delivering money used in preparing and executing the attack and playing a close role in assisting al-Badawi. Ali Mohamed Saleh and Murad al-Sirouri were both sentenced to five years in prison for forging identification documents for al-Misawa, one of the suicide bombers. Yemen, the ancestral home of Osama bin Laden, cracked down on militant groups aligned itself with the U.S.-led war on terror following the Sept. 11, 2001 attacks carried out by 19 Arab plane hijackers on New York and Washington. The United States has since provided equipment to Yemen's military to beef up port and border controls and trained Yemeni security forces to battle militants in this country, which has long been known for tolerating Islamic extremists.